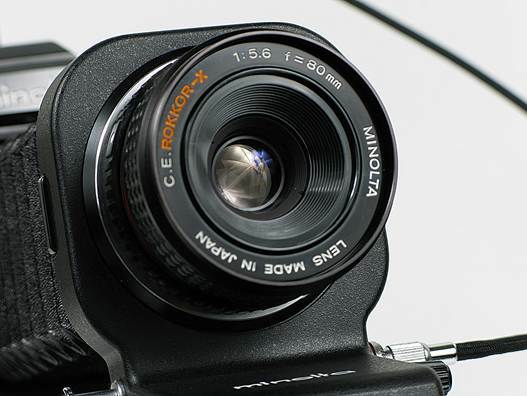 For precise focusing, magnification control and operating convenience, The Minolta Bellows IV features independently moving rack-and-pinion lens and camera standards. 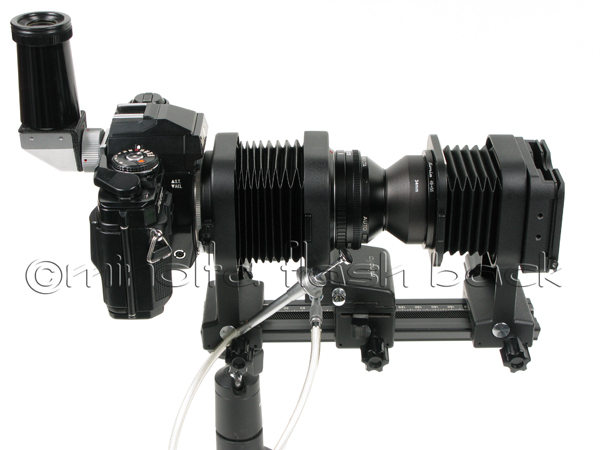 Its detachable bellows enables easy reverse-lens operation without adding accessory adapters. The camera standard's bayonet mounting ring rotates 90° for horizontal and vertical framing. The non-automatic diaphragm coupling in the Bellows IV requires exposures to be made with the lens manually stopped down. The Bellows IV is also compatible with other Minolta bellows accessories such as Focusing Rail AB-III, Macro Stand AB-III, and Slide Copier AB-III. 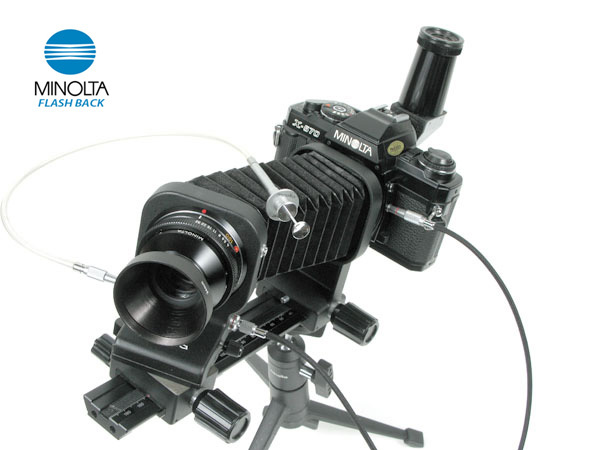 The Auto Bellows III is Minolta's flag ship bellows and is the heart of an advanced close-up system that enables many operations not possible before. Its independently moving lens and camera standards provide precise control of magnification and focusing for utmost convenience. The remarkable swinging and shifting mechanisms of its lens standard can be used separately or together for unique effects that are observable through the view finder. Automatic diaphragm stop down and shutter release are by special series cable releases or exclusive stop-down-release button on the bellows. A detachable bellows for simplified lens reversing, rotating camera bayonet mount and lockable diaphragm stop-down button are some of the many other outstanding features of this very versatile bellows. 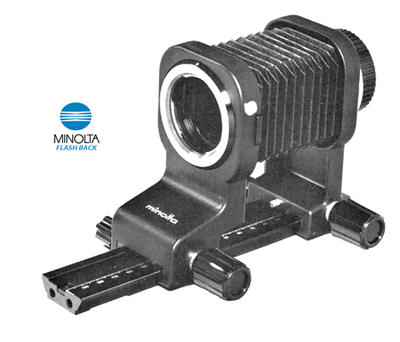 The Auto Bellows III is also compatible with other Minolta bellows accessories such as Focusing Rail AB-III, Macro Stand AB-III, and Slide Copier AB-III. There are two cables that were included with the Auto Bellows III from the factory. 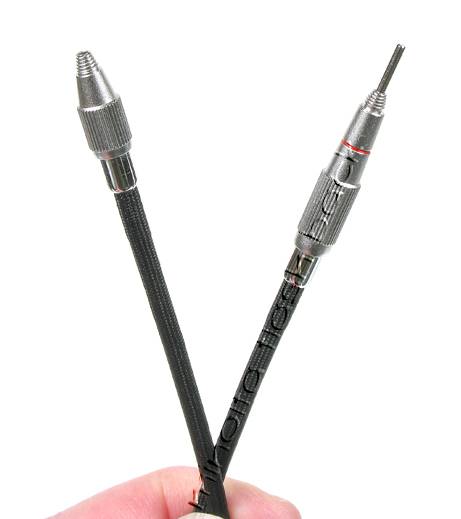 One is Cable Release II which a high quality standard shutter release cable which can be easily substituted should it be absent. The Bellows-Camera Connector Cable is one item you want to make sure that is included with a purchase of the Auto Bellows III. This special double-ended male cable (see below) attaches between the lens standard of the Auto Bellows III and your camera to couple the aperture stop-down mechanism with the shutter release. The above images show how Bellows-Camera cable connects from the bellows standard to the shutter release port on the Minolta X-Series and SRT series. You can still use the Auto Bellows III without the Bellows-Camera cable, but without the auto stop-down feature. 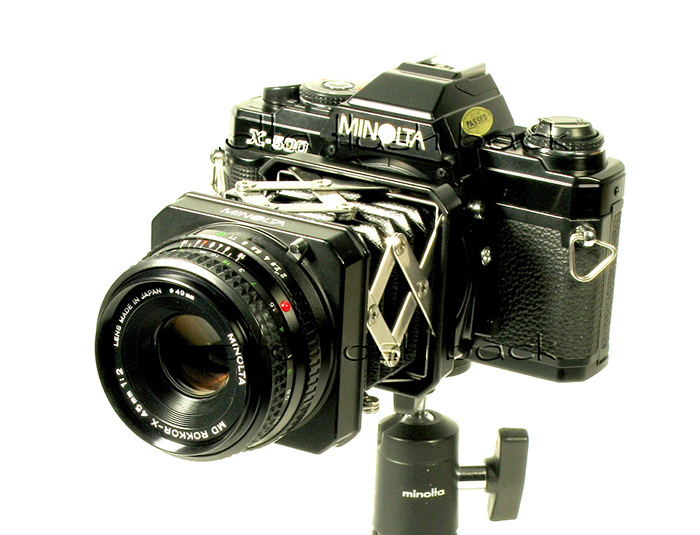 Minolta collectors prefer that the Bellows-Camera cable is included. The Bellows-Camera Connector Cable showing detail of both ends. The AB-III Slide Copier came standard with Auto Bellows III kit and could also be purchased separately. 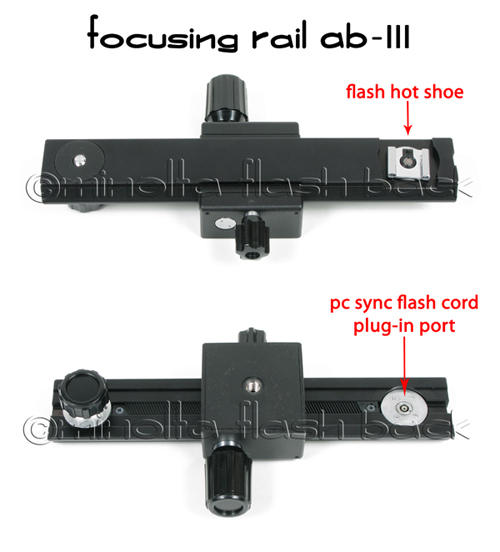 The Focusing Rail AB-III came standard with the Auto Bellows III kit and serves as a multi-faceted accessory. 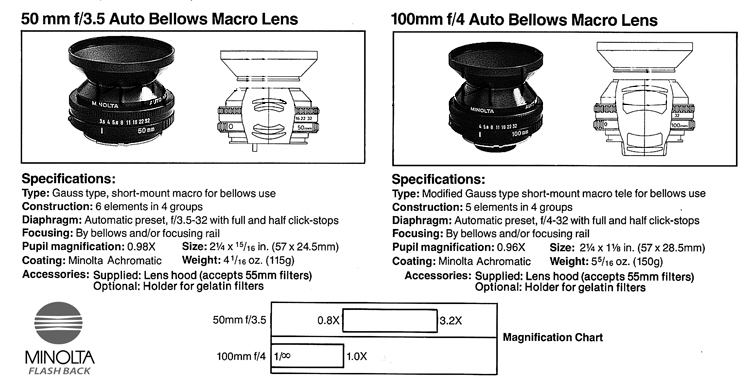 Minolta offered two optional Gauss type short-mount auto macro bellows lenses. 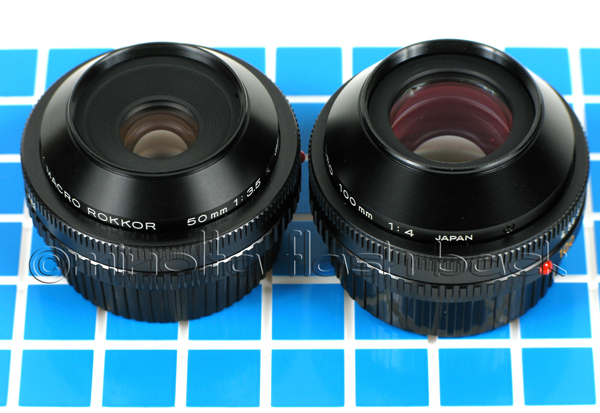 The 50mm f/1:3.5 tends to be more popular as it has a magnification ratio of 0.8X to 3.2X while the 100mm f/1:4 has a magnification ratio of 1/infinity to 1.0X. Macro lenses are designed as flat field lenses and work very well in close-up work where image edge distortion is undesirable. Minolta Compact Bellows is a take anywhere bellows unit that provides extensions from 41.5mm to 100mm and can be used with focal length lenses of 45mm to 200mm. With a 50mm lens mounted normally, for example, images from about 4/5 life size to twice life size on the film (0.8x to 1.9x) can be obtained; with the same lens mounted in reverse position, magnifications from 1.6x to 2.6x are possible. Used with a 100mm Auto Bellows Macro lens, the bellows enables focusing continuously from infinity to images more than 1/2 life size; the greater lens-to-subject working distance with this combination is especially suitable for close-ups of unapproachable subjects or for more convenient lighting. The compact bellows features sturdy, precise supports that move smoothly, can be locked securely in place, or collapse easily to minimum size. Minolta Compact Bellows is best suited for field work with a small tripod and remote shutter release. Great for hiking, backpacking and travel where lugging a full bellows system around is not practical. 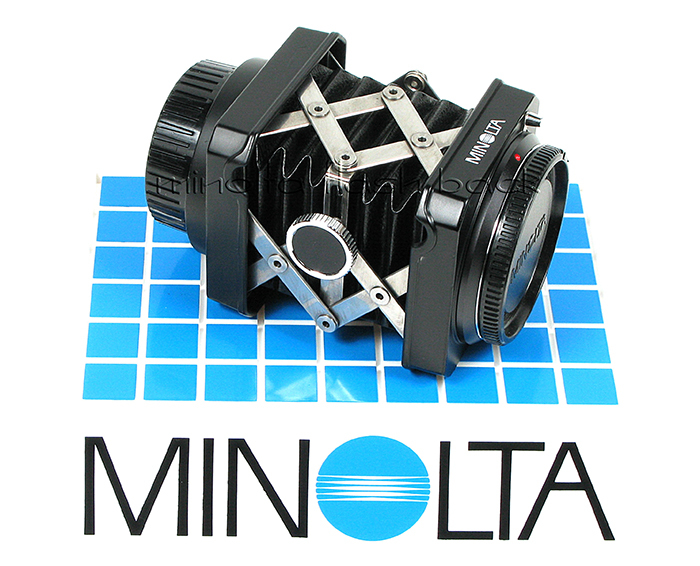 This bellows can be used on many Minolta SR Mount cameras such as the SR-T, XD, XE, XG, XK, X-370, X-570, X-700. You don't need a special macro lens to get started and can use many of your fixed focal length lenses on this bellows. It is common knowledge that this adapter allows you to attach a standard 39mm Leica screw mount lens to your Minolta SLR (SRT, XD, XE, XK, XG, X-series, etc.) camera body. Leica-mount lenses can be used only for close-ups or copying, since their back focus (registration) is different than Minolta lenses (43.5mm). Fixed back focus is not an issue when a Leica or similar mount lens is used on a Minolta bellows via the “L” adapter. One of the other “hidden” features is that you can use enlarging lenses or macro lenses with a Leica screw thread and mount them on your Minolta bellows. The picture shows a Minolta CE enlarging lens mounted on a Minolta Auto Bellows III. Enlarging lenses are commonly referred to as flat field lenses and work very well in macro work where image edge distortion is undesirable. I will be adding more information and photos on the Bellows Micro lenses soon as well as other tips and tricks for the Minolta Bellows system. Stay tuned.